Description: The Explorer Elite is the knife to reach for on your next big game hunting trip! Featuring a sturdy point for piercing and a fine edge and deep belly for skinning and slicing, as well as a prying tool on the extended tang that can be used as a screwdriver or for blunt force. Heavy-duty enough for camp chores, wilderness survival and shelter building, the Explorer Elite is the ultimate one stop shop. In-stock knives will usually be shipped on one of our next regularly scheduled shipping day. (Tuesday, Wednesday and Friday). Please use the links at the top of our web page to contact us via email or phone with any questions. You can also check the status of your order online anytime by clicking the "Order Status" link at the top of the page and entering your email address and order number. We accept all major credit cards, PayPal and PayPal Bill Me Later. Upon approved credit, PayPal Bill Me Later offers interest free financing for a set period. Terms will vary. Visit www.paypal.com for more information or to apply. Once approved, choose "Pay with PayPal" during checkout and select PayPal Credit as your payment option. We offer free shipping anywhere in the contiguous United States. Free shipping does not include insurance or that a signature be required for delivery. 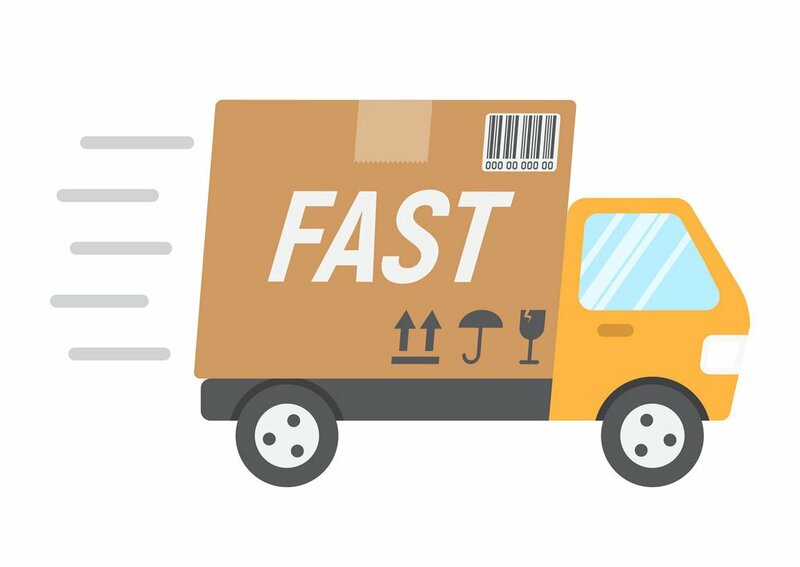 You may request insurance or that a signature be required for delivery for an additional fee by selecting the appropriate shipping option during checkout. 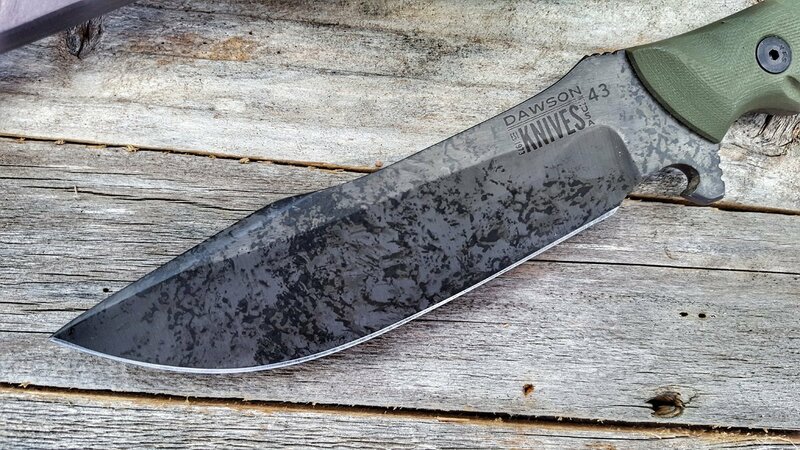 If you wish to change your shipping options after checkout is complete, please contact us immediately via phone (928-910-0770) or email (info@dawsonknives.com) and we will invoice you for any additional fees. We are not responsible for uninsured packages or packages shipped without a signature required for delivery that are lost, stolen or damaged during transit. Transit times vary according to destination address. Expedited shipping and shipping outside the United States are available for an additional fee. We offer simple engraving (up to 10 characters, including spaces) at no additional charge. This is ideal for adding a name, date or initials to the blade. Longer engravings are available for a fee. Call or email prior to ordering for pricing. Please specify in the "Order Notes" section what you would like engraved. All engraving is in block lettering. Please verify spelling and spacing prior to placing your order. If you need to make a change, call or email us immediately. We warranty that all of our knives are 100% made by us in the USA. Every knife and sword we sell is rigorously quality-checked prior to being made available for sale, and is guaranteed to be free of defects in both materials and craftsmanship. Our blade finishes are hand-applied and no two are exactly alike. 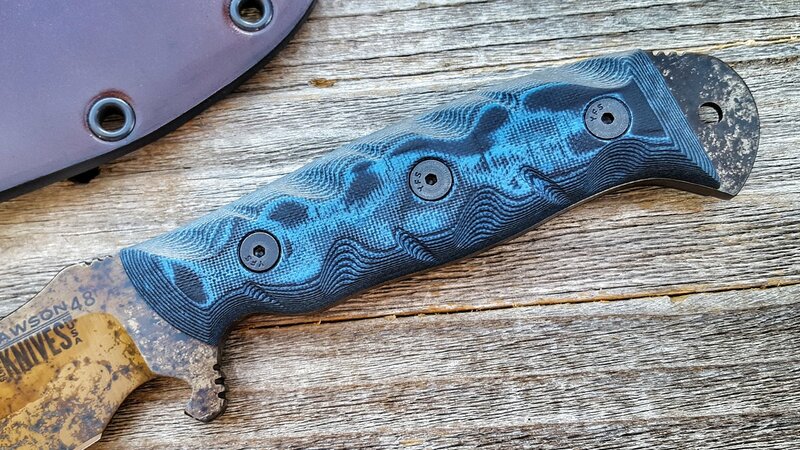 Variations in tones and coloring add to the uniqueness of your individual blade and are in no way to be considered a defect. We do not warranty against normal wear and tear or damage caused by abuse, neglect, lack of reasonable care, or using your blade to perform tasks for which it was never designed or intended. Include a short note indicating the concern, contact info and a check or money order for $15 to cover return shipping. We recommend sending your knife through a trackable shipping service and insuring it. We are not responsible for items lost or stolen during transit. If you are unhappy with your purchase for any reason, we will gladly extend you a store credit for the full purchase price upon receipt of your return in new, unused condition. We do not offer refunds on canceled orders. Shipping costs are non-refundable. 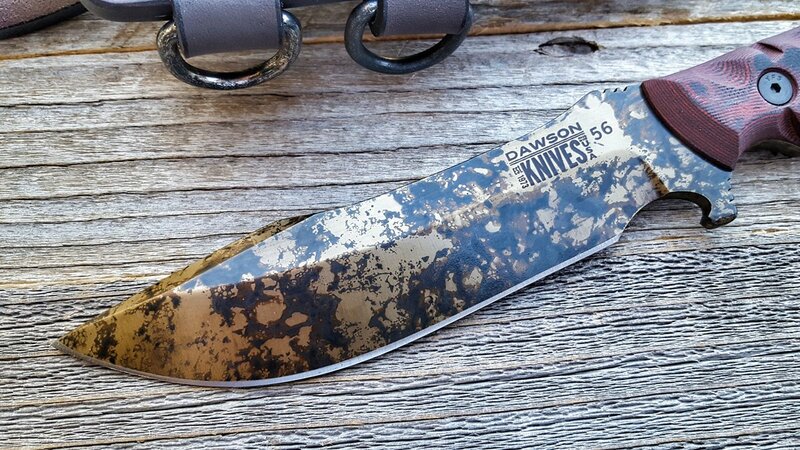 To receive your store credit, you must contact us at info@dawsonknives.com or via phone at 928-910-0770 within 7 business days of receipt of your items to notify us of the issue, and the item must be returned to us within 14 business days, unused, in the same condition it was received in. We will exchange any item that was incorrectly customized due to our error (e.g., black handle when tan was ordered, camo finish when black was ordered, etc.) for the same model with the correct specifications according to the original order. All items must be returned to: Dawson Knives, 8737 E Florentine RD, Prescott Valley, AZ 86314. If an item is returned due to our error, we will pay return shipping. If an item is returned for any other reason, you will be responsible for paying for your own shipping costs for returning your items. We suggest using a trackable shipping service and/or purchasing shipping insurance. We don’t guarantee that we will receive your returned item. Really love the weight and feel of the knife when field dressing. Its now my go to knife. Just wish the knife came with an easy to clean sheath as the leather looks nice but is not practical. The Hamon is faint but clearly visible. Great job. I'm pleased to own the first of its kind. The testing/proofing marks also give it some character other than that new out of the box look. Glad that I took the opportunity to own this fine knife. Thank you for taking the time to share a pic with your awesome review, Vincent! It's great to hear you're enjoying the Explorer Elite. Have a great day and God bless. My family have been Dawson customers for 30+ years, so I know that receiving a quality blade is implicit. That said, however- this Ronin is a downright work of art; nothing short of amazing and awe-inspiring. I could go on and on about it and its attributes, but I don't believe I would ever fully illustrate how awesome it really is. If you're on the fence about your first Dawson or maybe a larger purchase- just jump with both feet and you won't regret it. Sleek, modern gray highlights the subtle texture of raw steel. 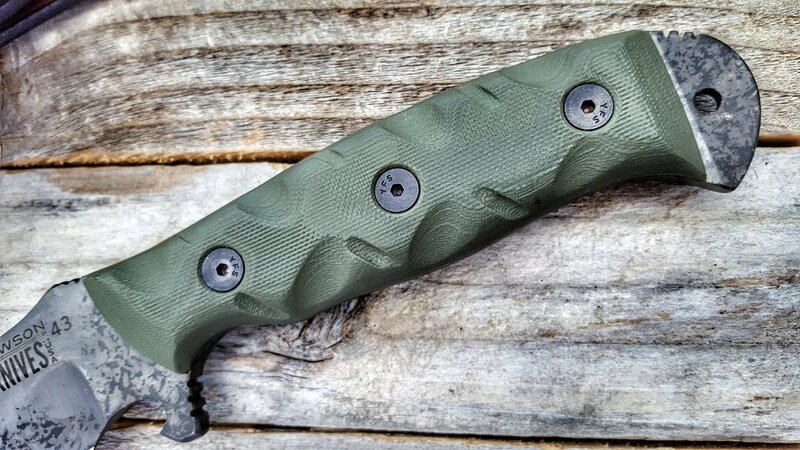 Available with the OD GREEN or BLACK G10 color options. We use .270 80CrV2, a German-rolled high carbon alloy steel for the Explorer Elite. 80CrV2 is tough and durable, made to take a lickin' and keep on tickin'. Our proprietary blade finishes allow the color, richness and texture of the raw steel to shine through. None of our finishes are painted on - what you see is in the steel itself. The rich, warm tones of this finish range from pale gold to warm amber. Available with the BLUE + BLACK, RED + BLACK and ORANGE + BLACK color options. 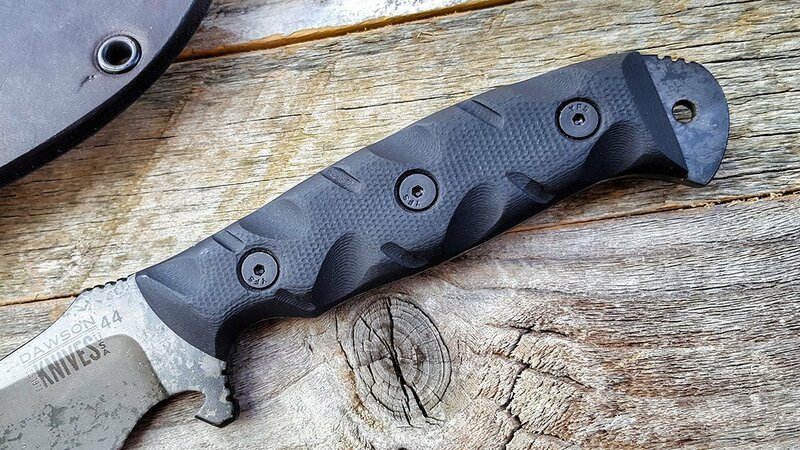 We're constantly researching the latest advances in materials and technology to deliver you the best custom knife available. Our family has been building quality custom knives for over 45 years. 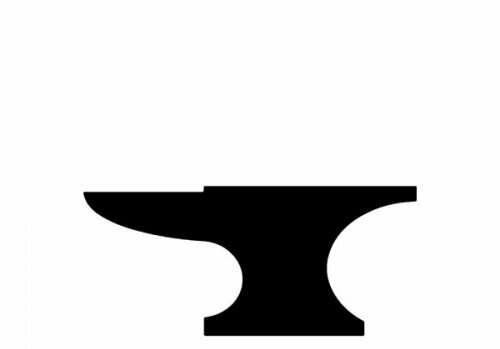 We do all of our own work in-house, from blade cutout to heat-treat, sheaths and sharpening. Since 1973, we've built our name on trust and craftsmanship. We guarantee every knife we sell for a lifetime. Each of our premium G10 handles is cut, textured and shaped by hand for outstanding comfort and usability. Three generations of our family work together in our knife shop near Prescott, Arizona. We're proud to be real American craftspeople. 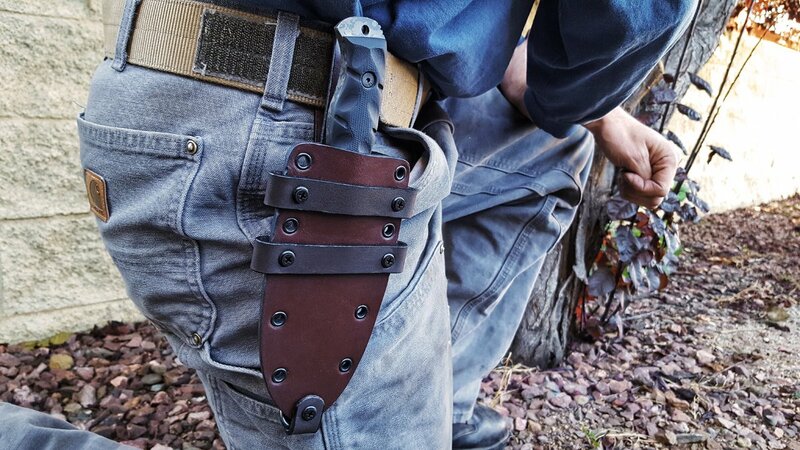 The Explorer Elite comes with our new leather/Kydex hybrid sheath system. 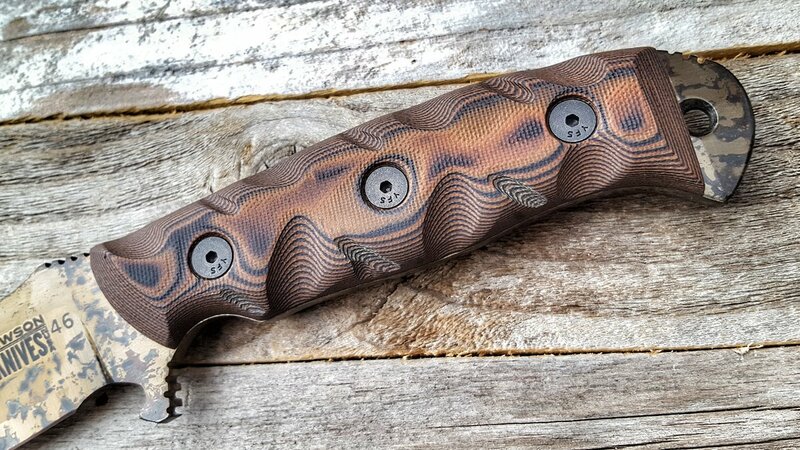 This sheath has a premium, rich brown leather face and a heavy-duty black Kydex back, custom-fitted to each individual blade. It can be worn upright or horizontally, and features removable rigging straps for carry on a backpack or vest. Order now - limited inventory available! "Not only is (the Explorer Elite) gorgeous, it’s absolutely tough. I took it camping as soon as it showed up. I put it through the ringer and it performed phenomenally... feels like an extension of your arm and it is extremely comfortable in the hand." (The Explorer Elite) has a perfect edge and its shape, feel and balance are just perfect for me. In fact it feels like they made it for me. I guess that's the sign of a really well made knife? "Extremely happy with my purchase, fits great in my hand and I look forward to using it... thanks again." We accept all major credit cards and PayPal. We also offer interest-free, no credit check layaway through Lay-Buy!